As web sites grow ever more complex and users spend even more time online, cybercriminals are stepping up their game to focus on exploiting legitimate sites – and the trust placed in those sites by users. Techniques such as cross-site scripting (XSS) and SQL injection attacks enable hackers to take control of web sites “behind the scenes,” redirecting users without their knowledge in order to steal data or spread malware. Qualys, Inc. is the leading provider of cloud-based information security and compliance solutions with 5,500+ customers in 85 countries, including 50 of the Forbes Global 100. The Qualys cloud-based platform and integrated suite of applications helps businesses simplify security operations and lower the cost of compliance, delivering critical security intelligence on demand and automating the full spectrum of auditing, compliance and protection for IT systems and web applications. Founded in 1999, Qualys has established strategic partnerships with leading managed service providers and consulting organisations including BT, Dell SecureWorks, Fujitsu, IBM, NTT, Symantec, Verizon, and Wipro. 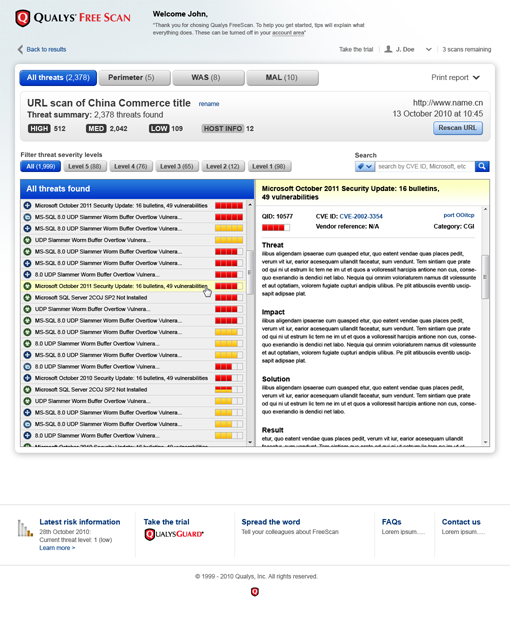 The company is also a founding member of the Cloud Security Alliance (CSA).